I do love a cheap n’ cheerful polish pick-me-up. No guilty spend and the sense of satisfaction that you got something purdy for a few pennies… in this case, I think it was about 99 pennies. Here’s a little something I dug out from the bottom of my stash, I think I bought it a couple of years ago on a trip to Beauty Base in Whiteleys at Queensway. I still have a couple more LA Colors shades that I haven’t blog-swatched. That’s the technical term for “worn” dontchano? 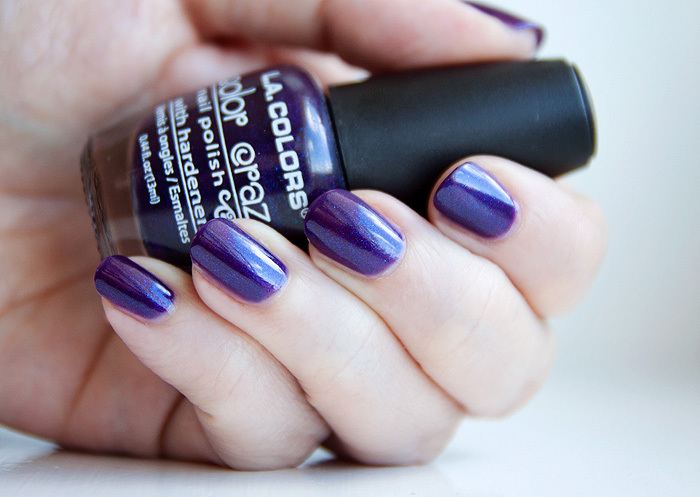 Morning Glory is a blue-toned purple with a strong electric-blue micro shimmer running through the base colour. It has a fairly watery consistency, the kind you think will never reach full opacity… when all of a sudden, it does. In this case, it took three coats to achieve the coverage you see above. I didn’t think we were gonna make it after two but it came good in the end! What was your last inexpensive beauty find? Pur-tay! I always was a sucker for a nice purple. I bought this last year so it’s probably still in stock!